I promise you I did not give him that for breakfast. At least the cupcakes I had baked for his birthday made an impression on him. I guess I will have to Betty Crocker it out for him on future celebratory occasions. Let’s hope he outgrows his egg allergy because store bought cupcakes are a beautiful thing. When it’s Full Speed’s turn to start the day I ask, “What would you like to wear today?” He responds, “My Santa shirt.” This confuses me. He doesn’t have a shirt with a Santa picture on it or even a holiday themed one. “What shirt do you mean?” I ask. “The red one I wore when I met Santa,” he explains. His tone implies that pretty much everyone on the planet except his Mom knows this. Red polo shirt it is then. I love that in the first ten minutes of my day that my boys are so entertaining. I think that means we are off to a good start. 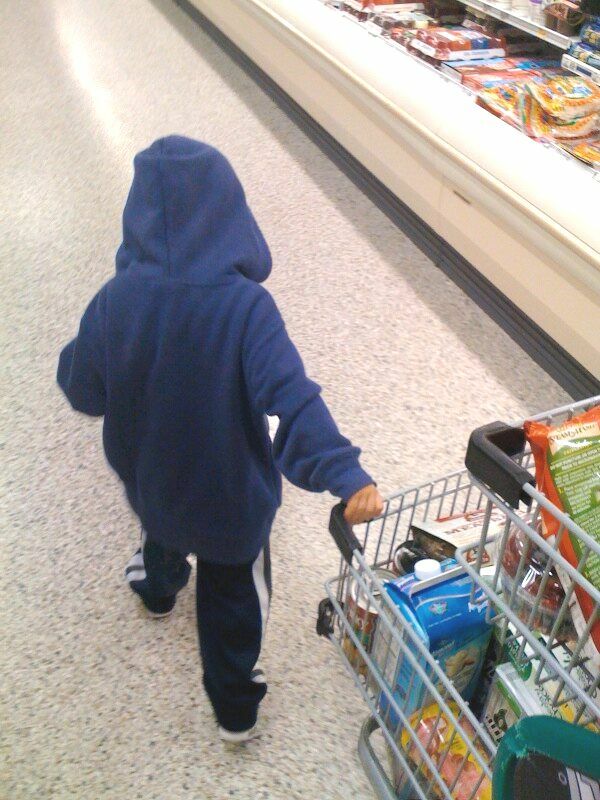 After T.Puzzle and I drop off Full Speed, we head to the grocery. In the past I have dedicated entire posts to his legendary meltdowns and unpredictable behavior. Today, I changed my game plan. It was risky but it paid off. I had to survey the area and make a hasty choice. On this particular weekday morning the place was dead with only a handful of staff and customers sprinkled about. I let him out of the cart. I know as you let that concept sink in, you have a great deal of fear and admiration for me. He helped me pull the cart and placed (more like plunked and thunked) items in the basket. It went slowly but it went well. 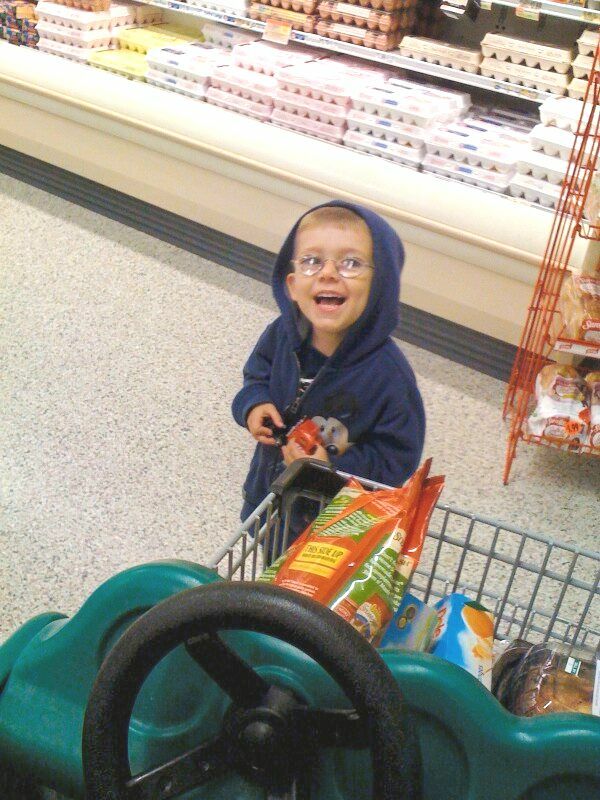 I even knew I had a spare fruit snack in my purse to bribe him to sit in the cart during checkout. It worked like a charm. My morning started off as slightly humorous like any other and then it turned into a supermarket miracle. God bless us everyone! First of all, this was the exact photo I put on our church blog before I decided to change it yet again! Liked the last 3 posts! Thanks, and yes, I am a big advocate of the no-duct-tape-as-discipline lifestyle(: Whether or not my boys agree is a completely different matter!